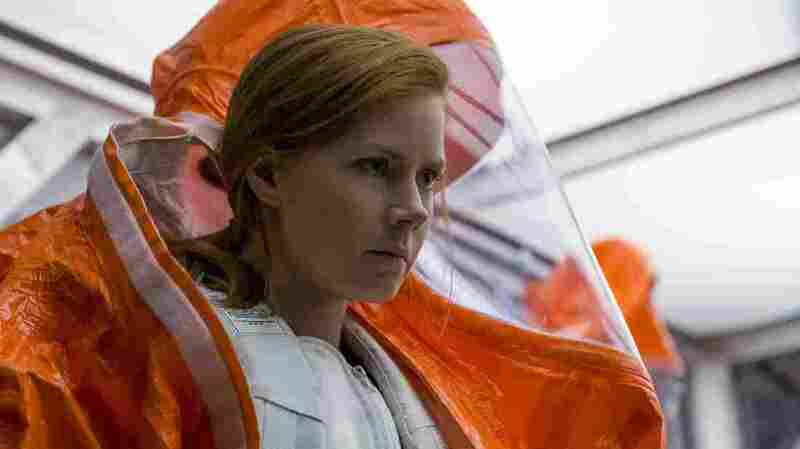 What We Can Know And What We Can Change: The Optimism Of 'Arrival' Arrival is, like many of our most beloved stories, deeply committed to the idea that knowledge and understanding are the paths to follow. Amy Adams plays linguist Louise Banks in Arrival. The setup of the film Arrival is familiar to anyone who's watched first-contact science fiction about aliens before: ships hover. Little is known. The military assumes the worst, and scientists thrum with curiosity. Dr. Louise Banks (Amy Adams), a linguist, and Ian Donnelly (Jeremy Renner), a theoretical physicist, are summoned to try to figure out the answer to a question that seems to be about aliens but hides in plain sight as a nod to philosophy: What is your purpose on Earth? The tool put to work on this question in the film (and in the Ted Chiang short story on which it is based) is language. Louise must begin by assuming that these aliens may not speak at all, may not have mouths, or may be so unfamiliar to her that whatever efforts they're making to communicate don't even seem to be communication at all. And so her task begins with a leap of faith that is, in many ways, unjustified: she assumes they want contact. She assumes they want to tell us something and that they want us to hear it, and that in some way, hearing it will allow us to decide what to do next. By taking this on as a linguist, she is, at least in one sense, an optimist. Faith in the value of communication is not self-evidently well-founded: why not just blow the ships up? Why not just eliminate the threat? Why even try? But at a deeper level, she represents — and Arrival itself represents — an optimism fundamental to many of the stories we tell and the stories we are told. So often, whether it's the reporters in All The President's Men, Dorothy in The Wizard Of Oz, or even the high-school kids at the end of Lucas who finally come to understand the humanity of their puny classmate and cheer for him in the hallways, there is a sort of unlocking that comes from trying to understand and from trying to get other people to understand. There is great faith in these stories that the more we know, the more we grasp, and the more we turn around and communicate to others, the better off we are — and the better we are, too. It's an assumption that, ultimately, understanding enables goodness that's waiting to be activated inside people who look like bullies and fools, if not inside the worst of our villains. It's a humanist point of view that treats most people as machines built with, if not the tendency to produce, then at least the capacity to produce good, just, rational, prosocial results if we can get the right inputs. It rests on an assumption that when something terrible happens, the right answer is to wonder what you didn't study enough, what you didn't understand enough, what you didn't communicate enough — rather than to suspect that nothing you could have understood or known or screamed would have mattered. Down that latter road lies surrender, of course. This optimism suggests another path: Here is a storm that came; here are the things we know now. Next time, we will at least make different mistakes. This is why so often, heroes in films are scientists or journalists or teachers — or wide-eyed children unburdened by the things that keep adults from listening. Every movie climax that has that "finally, he/she/they/we understand" moment of dawning realization is built on this same fundamental optimism, that problem-solving is about mastery. And it's mastery not only in an intellectual sense, but in an empathetic one: it's true whether you're talking about academic learning or a grasp of other people's circumstances. I now understand how these aliens communicate is a close relative of I now understand how this person feels. Optimism is a luxury, in many cases, more easily available to people who haven't been disappointed or menaced all that often. Moreover, it's easy to misread it as a justification for inertia — "Everything is fine; I need not act." This is not the optimism of Arrival. This is a motivating optimism, in that believing her job is important is what gets Louise moving. It is optimism as opposed to cynicism, not optimism as opposed to clear-eyed assessment of the danger of 12 spaceships of unknown capabilities hovering over 12 major cities of the world. She sees the ships. She is scared. Her faith is in the utility of a response. In Arrival, Louise never doubts that what she doesn't know, she can learn, that what she can learn, she can communicate, and that what she can communicate can change outcomes. She assumes that the decision-making machines around her need the right inputs, not different programming. She tries to understand, and then understand more, and then understand more, and then to tell everyone everything that might help. What is your purpose on Earth? There is a difference, of course, between optimism and foolish gainsaying of every lesson, learned over and over, about the tendency of tragedy to assert itself. And there are ways in which even perfect knowledge, or at least unimagined leaps in it, cannot empower Louise. Arrival is optimistic, then, not only because it is constructed around a frame of the power of study and learning, but because one of the things Louise learns is that the preciousness and the fragility of her life are intertwined. It is optimistic because it asserts that the answer is always to learn and teach and listen and heed, and when those things fail, as they will, to appreciate what you have more, not less. Embracing joy — in this movie, I am saying — is not the opposite of appreciating peril; the two circle each other like a binary star.